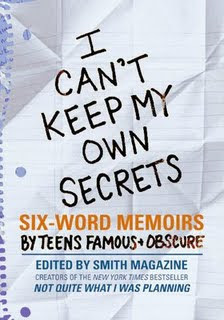 I'm not sure how familiar you all are with a series of books called Six Word Memoirs (a great collection of books filled with contributions from authors famous and obscure, all describing their lives in six words), but there is a great Six Word Memoir book coming out written entirely by teens! I'm so excited for it, not only because I'm sure it'll be funny and poignant and vastly entertaining, but because my six word memoir is in it! First off, the official trailer! It's really awesome, and will give you just a taste of what's in store. It's really neat how many of these you can empathize and connect with...like the title? That could totally be mine! At the end, there's a game you can play with your friends! Also, if you are a New Yorker, on Tuesday, November 3rd, they're throwing a huge party and teen story slam at The New York Public Library. And on October 29th, they're reading at Barnes and Noble...stay tuned for more details! And put the book on your wish list! And congrats!! :) Great stuff.